Rather than rely on established designs, Audio-Technica have used some genuinely innovative thinking to come up with this unusual, multi-diaphragm vocal mic. How does it perform? However, I've been fortunate enough to have been loaned a review model, with a rather unusual serial number: SN0000! By the time this review hits the printing presses the news will be out, but at the moment I feel rather honoured to be among the few that have seen and heard the real thing. So what is the AT5040? Well, for starters, it is a relatively large and heavy vocal microphone, its all-aluminium body measuring 165.3mm (6.5 inches) in length by 57mm (2.5 inches) in diameter, and weighing in at 582g (20.5oz). It has a fixed cardioid polar pattern, derived from a very unusual 'large diaphragm' back-electret capsule — of which more in a moment. 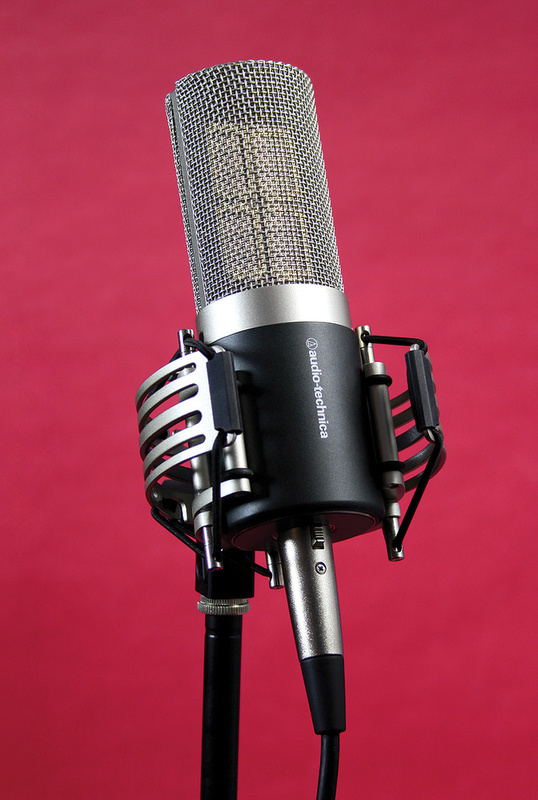 The top 85mm of the mic comprises a large dual-layer, fused-mesh brass grille, while the bottom 65mm of the body is painted in a low-reflectivity matte-grey finish, with the Audio-Technica logo identifying the front of the cardioid pattern. The usual XLR output connector is recessed into the base of the mic, and the brand new and ingenious AT8480 shockmount, supplied with the AT5040, clips around the base (see 'Shockmount' box). The mic ships in a custom hard-shell carrying case, padded with die-cut foam compartments for the microphone and shockmount, and apparently every AT5040 is hand-assembled and fully tested and inspected for quality control. What's so unusual about the diaphragm, then? Well, despite the popular myth that the technology of capacitor microphones was perfected in the 1960s, there are, in fact, still many areas in which their performance can be improved, starting with the capsule itself! 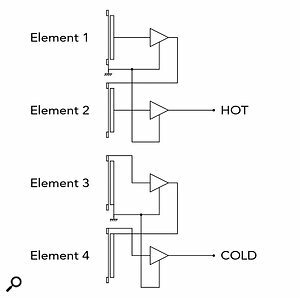 In this respect, the AT5040 differs from most conventional capacitor microphones by employing four small, closely mounted rectangular diaphragms instead of a single, large circular one. This kind of arrangement is not entirely new: I've come across a few microphones that combine multiple capsules, such as the Line Audio Design ST, SM and QM mics, which use three small, circular diaphragms in a triangular configuration. However, this multi-capsule approach is fairly rare, because of the inherent cost and complexity. Thankfully, the boffins at AT relish a challenge and thrive on coming up with clever and innovative solutions. For the AT5040 they wanted to combine the familiar benefits associated with a large-diaphragm design — which include high sensitivity and very low self-noise — with those of a small-diaphragm mic, such as the better high-frequency extension and precision, greater ruggedness, and better temperature stability. Moreover, by using small rectangular diaphragms, the relatively low single resonant frequency of a large circular diaphragm is replaced with two higher and weaker resonant frequencies, thanks to the dissimilar length and width dimensions of a rectangle. The innovative quad-element capsule employed in the AT5040 is actually the largest the company has ever made, being roughly 60mm high and about 35mm wide. Since each diaphragm has a surface area of 254.4 square millimetres, the combination produces a total surface area of 1017.6 square millimetres. To achieve the same diaphragm area with a conventional circular design would require a capsule nearly 1.5 inches across, which would be completely impractical, if not impossible, to build! The clever A-T arrangement solves that problem very elegantly, and Audio-Technica claim that this configuration of rectangular elements also provides a smoother 5kHz to 20kHz off-axis frequency response than would be possible using a conventional circular capsule. Each capsule's diaphragm is two microns thick, with a vapour-deposited gold conductive layer. They are all 'pre-aged', so that their characteristics remain consistent over the mic's lifetime. The diaphragm is also moulded with a patented double-wave 'honeycomb' surface pattern, which increases the effective diaphragm area slightly while enhancing its stability and rigidity. These are electret capsules, of course, which store a static electric charge on the inside of the backplate, and their manufacture involves another pre-ageing process to ensure that the charge remains stable and linear. The four individual electret elements used to construct each complete capsule are precisely matched to one another, and the entire assembly is supported on a floating internal shockmount. The AT8480 shockmount, as viewed from above and in the 'open' position. When the mic is pushed into the mount, the C-shaped brackets close around it and are held in place with magnets. Many people assume that traditional DC-biased capsules are inherently better than electret designs, but that's a long outdated fallacy. Many manufacturers produce world-class electret microphones now (DPA being one of the more familiar standard-bearers, of course), and in recent years, several companies have developed large-diaphragm electret microphones that outperform traditional DC-biased designs quite comprehensively. Audio-Technica have considerable experience in manufacturing extremely high-quality and consistent electret capsules, and this design approach offers some very worthwhile benefits that might not be immediately obvious. Traditional DC-biased capsules need a DC bias voltage — usually something in excess of 60V — and that requires some form of DC-DC converter to raise the phantom-power voltage to the required level. However, DC-DC converters consume power to work, and can generate unwanted electronic noise and other artifacts. Since an electret capsule doesn't require the DC-DC converter, more power is available from the phantom supply to drive the microphone's output circuitry, which allows a greater maximum SPL capability. There is no risk of unwanted noise and other artifacts from the DC-DC converter to degrade the signal quality. The impedance-converter electronics in the AT5040 are also supported on a floating shockmount, and are constructed entirely from discrete components. The relatively minimalist design, without filter or pad switches, is as advanced as the capsule, with the four elements' outputs being combined in a most ingenious (patent-pending) arrangement that delivers a fully balanced output with minimal noise. 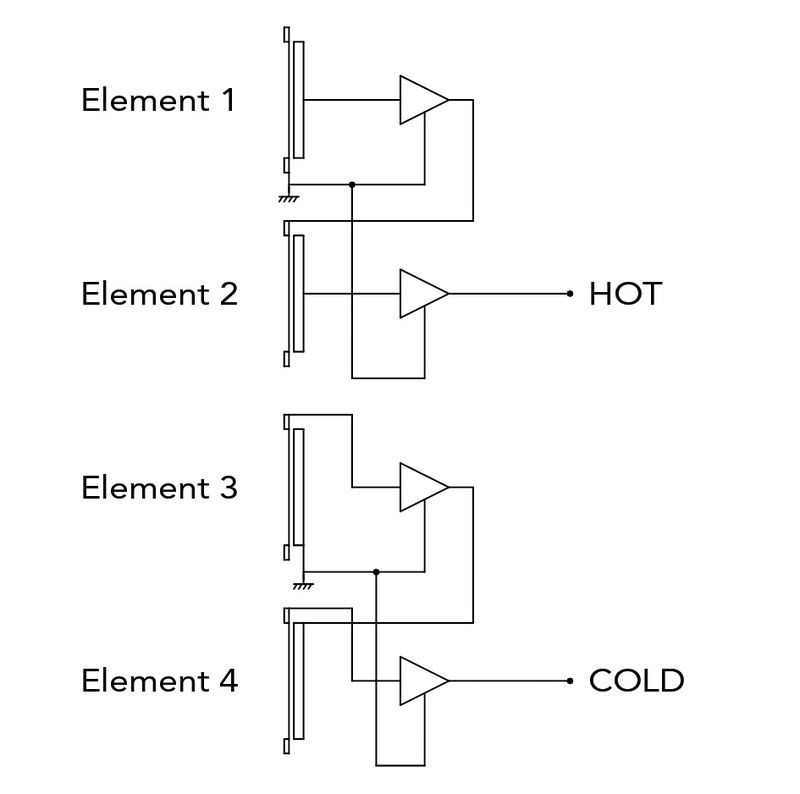 In simple terms, the four capsules are wired as two pairs, with the elements in each pair being connected in series. One pair is used to provide the 'hot' side of the balanced output, while the other pair provides the 'cold' side of the output — a configuration that quadruples the microphone's sensitivity but only doubles the self-noise. Genius! The AT5040 is, first and foremost, loud. Recording relatively gentle vocals at a distance of about eight inches, with peaks to around -10dBFS in the DAW, required no more than 35dB of gain from the preamp — I'd normally expect 40-45 dB with other common capacitor vocal mics, and more with dynamics. Moving on to the quality of the vocal sound when the mic is used as intended, the AT5040 has a very clearly defined sweet spot, and the vocalist has to remain well centred to achieve the excellent sound quality of which this mic is capable. This isn't a mic that would easily cope with a pair of vocalists in close proximity — they'd both sound off-axis before you started! The AT5040 is definitely a one-customer-at-a-time model, but there's nothing wrong with that as long as you know! As you might expect with such a tall capsule, vertical displacement of the microphone relative to the source produces a very rapid and obvious reduction in high-frequency response, as does moving off-axis laterally. So if the mic is mounted low, for example, and the singer moves in and out, they could easily end up, in effect, singing over the top of the capsule and sounding well off-axis. I would suggest a vocalist would have to exhibit a fair bit of discipline to maintain their position in the sweet spot to sound good all the time. However, with the vocalist centred on-axis, the sound from the AT5040 certainly grabs the attention. It is full-bodied at the bottom, but also very clean and airy at the top, with a superbly detailed mid-range and an effortless sense of presence and vitality. There is a pretty strong proximity effect that becomes very obvious if you move closer than about eight inches, but even with this enhanced low end the sound never loses its focus and clarity. The AT5040 sounded great on a couple of different male vocalists I placed before it — but then, most vocal mics cope well with male vocals anyway. The real test is female vocals, since some capacitor mics sound fantastic and others utterly horrible with one voice, and the complete reverse with another! It's all about the way in which the mic's presence peaks and resonances lie in relation to the formants and harmonics of individual voices. The AT5040 has an almost negligible presence boost and, as a result, I found it worked nicely on most female voices. That makes this a more versatile vocal mic than many, which helps to justify its pretty high price. In addition to its very high output level (which could easily overdrive preamps without a pad, given a singer who likes to belt it out! ), I was astonished by the huge subsonic output that occurs when any mechanical vibration reaches the mic, or air blasts hit the diaphragms. As part of my initial tests I was hand-holding the mic so that I could easily hear how it sounded on- and off-axis, but even quite gentle movement and handling generated a massive output level below about 25Hz. This was so large that it completely overwhelmed, let alone overloaded, several different preamps I tried with the microphone. Unfortunately, the high-pass filters of most studio preamps come after the initial input gain stage, and so are of no help in preventing LF input overload. This issue is well known in film and TV audio circles, where waving microphones about on the ends of long 'fishpoles' can also generate fearsome levels of unwanted subsonics. So, I rummaged about in my old sound recordist's box of useful gizmos and found an in-line high-pass filter, which cured the problem nicely, as did using a 20dB in-line attenuator — both proving that it is the mic's inherently high output level, combined with very large amounts of untamed capsule LF, that was causing the problem. To be fair to the AT5040, when mounted in its bespoke shockmount from an isolated stand, and with a protective pop-screen in front of the capsule, I had no further ultra-low frequency overload problems during conventional recordings (although the some careful high-pass filtering applied in the DAW was always helpful). In light of that, I wonder if perhaps Audio-Technica should look at tailoring the mic's low-frequency response a little more, or maybe even revisit the idea of having a high-pass filter switch on the mic. In the meantime, the shockmount supplied with the AT5040 is brillantly designed, and with the mic stand is positioned well away from tapping feet there shouldn't really be any problems. Given the mic's very neutral tonality when placed outside the proximity effect zone, the AT5040 would potentially make a useful all-rounder of a microphone if you always worked with solo sources located perfectly on axis. However, the heavy off-axis high-frequency attenuation of the mic makes it rather less useful in more practical situations where off-axis spill is likely to be an issue. Aside from my reservations about the extreme LF response of the microphone and its ability to overload mic-preamp input stages, the AT5040 is an impressive microphone, both in terms of its innovative design and its gloriously smooth and detailed sound character. I look forward to further spin-offs of this exciting technology in more affordable models in future. The UK list price enters the AT5040 into the same playground as mics like Brauner's VMX and VM1 models, Josephson's C715, and Neumann's M149 — all seriously high-end mics frequently employed for vocal duties. Rather less typical, however, is the very low equivalent self-noise figure of just 5dB(A) SPL, which, when combined with the maximum sound pressure level of 142dB SPL (for one percent THD), suggests a dynamic range of 137dB. That is a very impressive and quite unusual achievement, theoretically requiring a full 23 bits to convert faithfully — which would be a challenge for most A-D converters! The mic's sensitivity is also unusually high, at 56.2mV/Pa — almost high enough to forego a mic preamp altogether if you have a powerful vocalist! The review microphone's frequency plot indicates a pretty flat response, lying within about 2dB across the full bandwidth. There is a slight +2dB bass bloom below 80Hz, quite possibly due to the proximity effect (although the plot was measured at a distance of 12 inches, apparently), and a presence lift of a similar amount between 1-5 kHz, along with a second, smaller peak centred around 10kHz. Looking at the polar pattern plot reveals a rather less uniform response, although perhaps that is to be expected. Fundamentally, the AT5040 has the familiar traits associated with all large-diaphragm capsules, in that the polar pattern is a tidy, standard cardioid at 1kHz, but narrows considerably as the frequency rises, tending towards a hyper-cardioid pattern by 5kHz, and a narrow super-cardioid by 8kHz. Conversely, the polar response opens out considerably at low frequencies, reaching a sub-cardioid pattern at 200Hz and becoming progressively more omnidirectional below that. In practice, this means that off-axis sources will tend to sound relatively dull and coloured compared to on-axis sources — but that's nothing new with large-diaphragm mics, and is probably of little significance in a microphone specifically designed as a studio vocal mic. The way the outputs of the diaphragms are summed together yields a quadrupling of output level, while only doubling the capsule's self-noise. Audio-Technica's innovations haven't been restricted to the AT5040 microphone: the brand new AT8480 purpose-designed shockmount is an engineering joy to behold, too. The basic design is a variation on the familiar 'cat's cradle' idea, in which the inner mount (which holds the mic) is suspended from one very large elastic loop that zig-zags between three posts above and below the inner cradle, and four corresponding anchor points on the top and bottom of the outer cradle. It's a very nicely engineered accessory, with the elastic cord tension in each suspension link being fixed by locking screws in each of the inner cradle mounting posts, to stop the elastic from slipping back and forth. However, I imagine this arrangement also means a return to the dealer when a new elastic loop is required, as it is threaded through the posts rather than just hooking into them, and thus has to be 'installed' rather than simply replaced! One very neat part of the design is the use of a magnetically latched inner clamp arrangement. 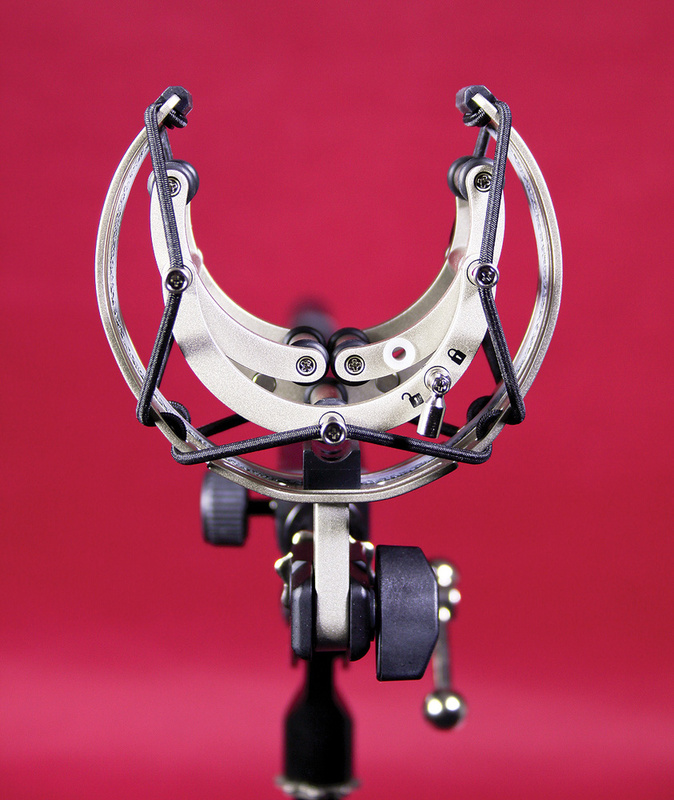 The inner cradle incorporates two semi-circular 'cup' brackets, each pivoted from the outer edge of the inner cradle and fitted with rubber 'O' rings to cushion the microphone and prevent any body resonances. The 'inside' ends of these two rotating cups are fitted with strong embedded magnets that mate with corresponding magnets in the static frame. As the microphone is introduced into these cup brackets, they rotate with the pressure so that the outside edges close around the sides of the mic just forward of the half-way point. This grips the microphone very securely, and the inside edges simultaneously move back into the inner cradle until the magnets snap everything into position. In this condition, the mic can be pulled out and removed, if required, but it needs a reasonable effort and the mic is very unlikely to fall out accidentally even if inverted and shaken. For complete security, though, there is a manually operated and spring-loaded locking pin that fixes the cups in the closed position. The whole design is very elegant and attractive, works well in providing vibration isolation, and still allows the mic to be installed and removed quickly and easily. Huge subsonic output from vibration. An innovative microphone that combines the best attributes of both large- and small-diaphragm capsules, offered complete with an ingenious shockmount that helps to justify the cost!